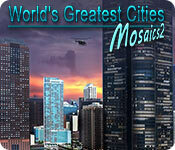 World's Greatest Cities Mosaics 2 is rated 4.6 out of 5 by 10. Rated 5 out of 5 by Limey2 from Worlds greatest cities mosaics II This is the first one I have tried in this series. I was surprised to find I enjoyed it. It is different from the other mosaic puzzles (e.g. penguins) with actual patterned mosaic tiles instead of just plain colours. I especially enjoyed the ones with an actual landscape as the backdrop instead of making a picture with different coloured tiles. It made a refreshing change. Yes, some of them are basic mosaics, but this one has some of the other style tiles. Makes it just a bit more interesting. I play the mosaic style games more to pass the time, but these ones are a lot more interesting. Makes me want to play more. The 1 hour demo just wasn't enough. Rated 5 out of 5 by kristidumplin from It's a great game, but, there are few caveats. I love nonogram games, griddlers, mosaics - whatever you choose to call them and this probably tops all of the games like this I've ever played, BUT - if you've never played a game quite like this, there are a few things that you should know. Number one - some of the puzzles are animated! As you complete certain puzzles, little animals or cars will zoom around what you've built, even if you haven't completed the entire puzzle. That can be a bit off-putting if you, like me, had never seen a griddler, nonogram, or mosaic puzzle move! I found myself just watching the little cars...lol. Number two - some of the puzzles were a bit hard for me to complete without a mistake because I couldn't tell how many squares I had actually filled with a certain color because the squares all blend together. 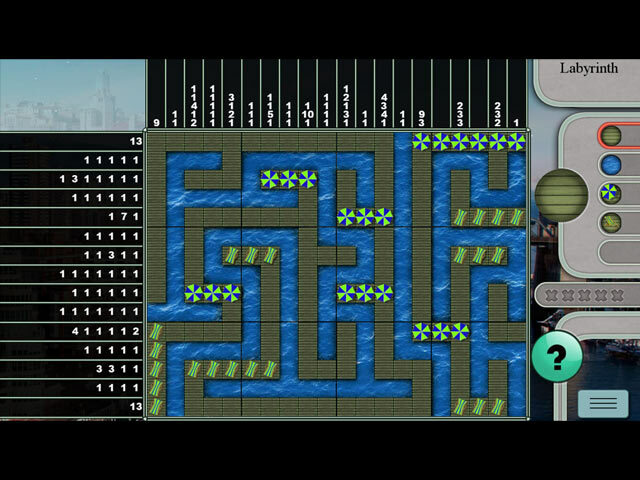 For instance, there are puzzles in which you build gardens or roads and the squares you fill all blend together. I made several mistakes simply because I wasn't cautious about making sure how many of any one color or texture or surface I'd built. I figured out what worked for me and the number of mistakes dwindled. Number three - and the last one. Some of the puzzles are done with Roman numerals. It's fun to see if you can remember learning them in grade school, but, I went through grade school a LONG time ago...lol. Fortunately, if you rest your cursor on the Roman numeral, the number itself will appear, so you don't have to guess what the number is. Besides those three caveats, the game is amazing! All of the things I mentioned before are what make the game so much fun, but, it's really different than any I've played, not having played the first in the series. I definitely will be buying the first one ,too.! Rated 5 out of 5 by heleanthia from mosaics with a fun twist Not the same old nonograms which can be dull and sometimes TOO challenging. Nor are these mosaics too easy as in the Penguin series. I love all mosaics but the World's Greatest Cities hold my interest for hours; their variety, customizable difficulty levels and even a timer if so desired. Me I play for relaxation so no timer.... I also adore the music . Rated 5 out of 5 by dachsy from A Winner All The Way! I have the first in this series and have enjoyed playing it very much. To see number 2 appear, fills me with delight. Others have espoused its virtues, and I concur with them. Everything is here including animated scenes unfolding as you play. It's a pure delight in the world of mosaics with all its innovations. It just puts the penguin to shame. If you want much more than just a basic mosaic game, you must try this. You won't be disappointed! Rated 5 out of 5 by yelwbkrd35 from New high standard in mosaic games!! This will raise the standard for mosaics from now on. Challenging and at times for me... took some concentration. Recommend highly!! Rated 5 out of 5 by grandmacathy from Beautiful scenes and fun to play! I enjoyed the first World's Greatest Cities Mosaics, and this one is just as enjoyable! There are over 100 levels which are multicolored, and each color is worked separately. Like many of the multi-colored nonagram-type games, the number of colors varies depending on the picture. What I like about the multi-colored levels is that they are more challenging in one way because there are more spaces to fill in, but there are also more avenues to research without using the hints or guessing. If I have to guess in one of these games, I have to find a lot of other pluses to make me buy it. Guessing just takes all the fun out of the game for me. The draw is the logic of using the clues of how many spaces are filled with a color, and then deciding which could be empty spaces and which are not. The scenes behind the grids are very interesting and appropriate to the city named for the level. The World's Greatest Cities Mosaic games also have labyrinths every so often, and these labyrinths are beautiful. They also have moving pieces in some of them, like the turtle in the first one. In the labyrinth levels, you build the labyrinth similarly to the other levels, but instead of colors you use stone paths, flowers, green grass, bushes, and waterways. Then you find the path for the cannonball to travel to get to the end. Nice touch! Rated 5 out of 5 by romany09 from My Favorite Mosaic Puzzle Loved their first one and now so happy to have another one. There is so much depth in the illustrations: click a square and flowers appear, turtles swim in the water, and some are "labyrinths" that must be solved. 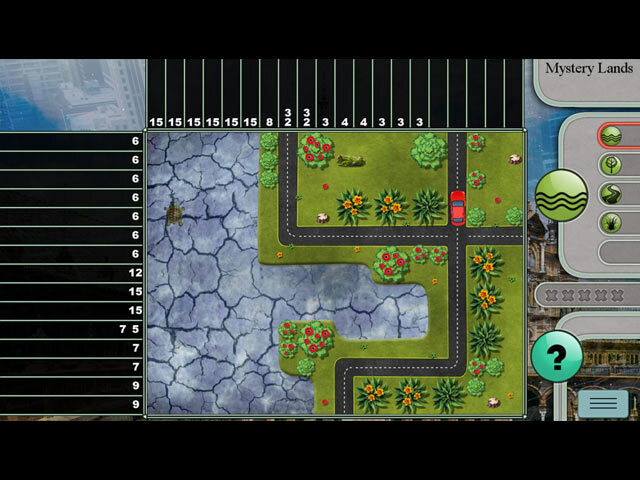 Roman numeral puzzles are once again included and snippets of the cities highlighted in each level. A new feature was added to the artwork: edges and angles rounded off to make more vibrant pictures. Relaxing music, lovely colors, and of course I bought it! Rated 4 out of 5 by pennmom36 from AWESOME UNCOMPLICATED MOSAIC VARIETY If you're looking for a little variety this is certainly the mosaic game for you! 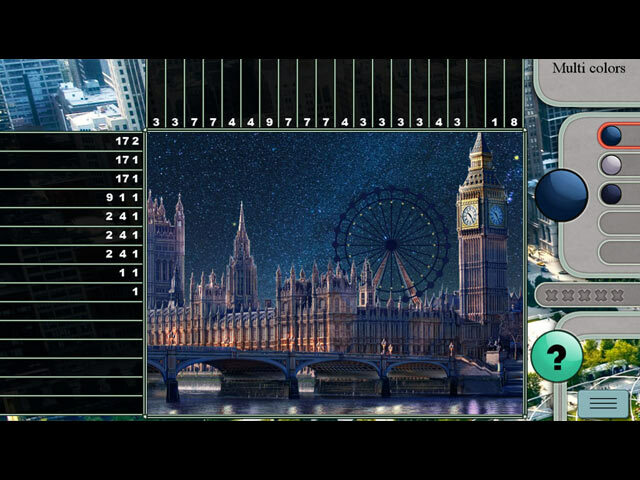 You can play in a Casual, Normal or Expert difficulty mode, or you can customize the difficulty mode by choosing if you want to play in a timed mode, if you want bonus points as a time bonus, whether you want numbers crossed off one by one or only when the entire row has been completed, and you can set the number of mistakes allowed from 1-4 and how long it takes for the hint feature to recharge from 30-120 seconds. You can then choose to play the Traditional (multicolored) Mosaic Griddler games, or you can pick a level that offers different features. They have added a new feature, of geometric shapes that have half tiles etc to give the puzzle a more realistic effect with curved, softer edges. Mystery Lands will fill in cells in a unique way, that create a scene such as a pond with a swimming turtle, a grassy area and even beautiful flowers. Labyrinth will form a maze where a ball is moved from point A to point B as tiles are filled in. Rome type grids are the same as the Multicolored type levels, but the numbers on the columns and rows are Roman Numerals, which could prove to be a bit of a challenge with larger numbers. In my opinion, this game is far more entertaining that the last one offered, and so much fun, enjoy! Rated 2 out of 5 by beltie from Not much improvement from the 1st I didn't care for the first game, but thought perhaps the second might have been improved. Although the colors are a bit better, and the controls aren't as buggy, I still really don't see much improvement from the first game. Want to solve logic puzzles not guess puzzles. Backgrounds are still way too busy for my tired eyes. Although many enjoy the maze aspect of this series, I'm not one of them. If I wanted to play an arcade game, I would purchase one. Have no desire to move a ball through a maze in a logic puzzle game. I do enjoy arcade games, but this isn't the place for that IMHO. If you didn't like the first one, doubt you'll like the second. But . . . give it a try, as I did. You might enjoy it.